All of these materials might belong to a single object set up to use multiple materials (a multi-material), or multiple objects using individual or small groups of materials per-mesh. Either way the numerical sequence appended after the label is what distinguishes each instance, not specifically the word used to describe or define the material. The numerical append is similar to Blenders instancing append where *. [n] is added to copies of everything to make them unique, e.g., duplicating Cube becomes Cube.001, Cube.002 etc. Covfefe table. Blue-marbled covfefe table with multiple materials (multi-material); one for the marble top, the other for the wooden structure. 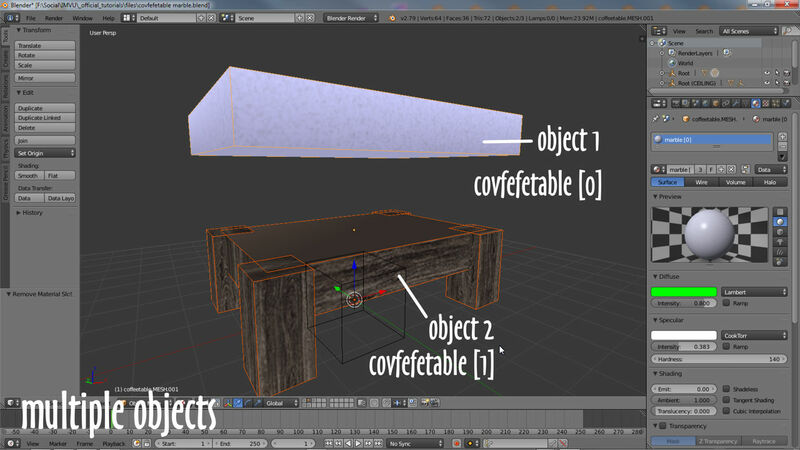 This structure is important for materials to work Blender, and IMVU, which gathers the information it needs from the Material data created, namely the label (name) from Material properties, and the image linked in Image settings. So long as this both the hierarchy and naming conventions are followed Blender will export fully compatible materials to IMVU. Although IMVU ignores Texture information the slot needs to be included in Blender for materials to suitably export for IMVU. 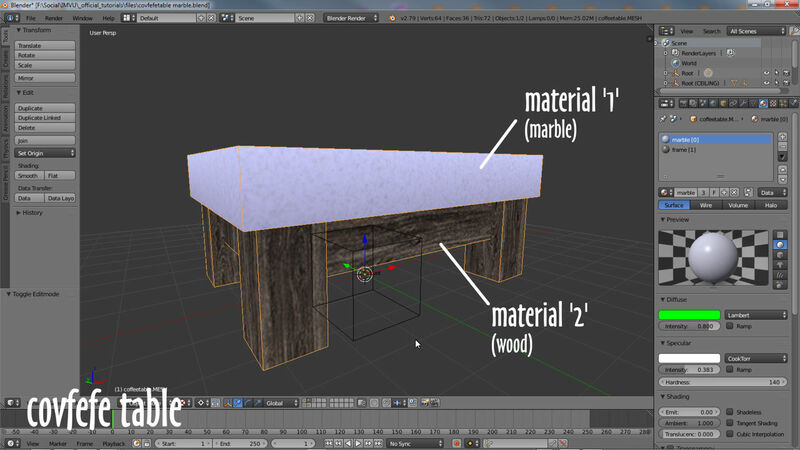 Material Properties, Texture Properties and Image settings (a sub-set of Texture Properties), each needed to create a valid material in Blender. With an object (made in Object Mode) or mesh selection (made in Edit Mode) available, to create a material left-click the Material Properties button (sphere icon). If the panel that’s displayed is blank click the + New button to populate with an entry called Material (or Material. [n], for example Material.001 if Material already exists, or more than one new material is created). The settings and options now displayed are the materials core properties. Next left-click the Texture Properties button (checker icon). And again if the panel is blank click the + New button to populate. 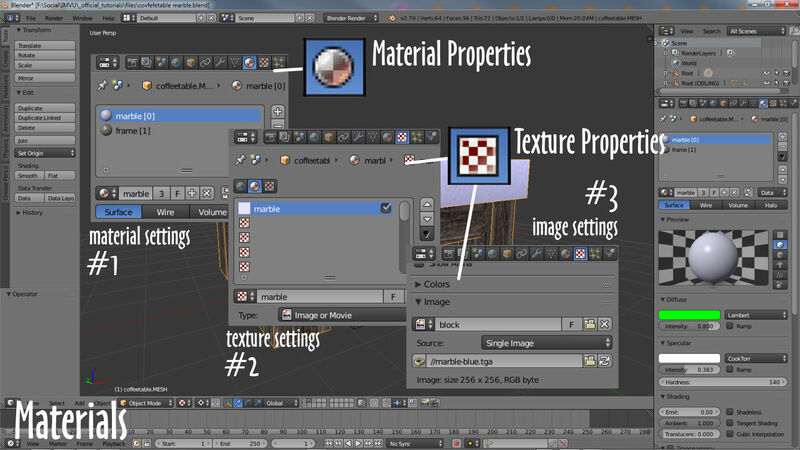 This creates a set of Texture Properties linked to the initial Material slot. Once these two sets of properties are available, whilst still in Texture Properties, scroll down to the Image sub-section and do one of two things; 1) click the + New to generate a new Image (in the pop-up type a Name, set a Width and Height size, select the Generated Type then finally click OK) or 2) click Open to browse to, select and load in an external image file, a TGA, PNG or JPG (to match what IMVU can use/convert). If after creating a set of Texture Properties the Image sub-section is not visible, directly under the Texture list aperture click the Type selector and choose Image or Movie from the list – this sets the type of image to associate with the material, Image or Movie being necessary for IMVU. Once a bitmap image is loaded into Image settings click the Material Properties button again and either; 1) double-click the entry in the Material List to activate for editing and give the Material a name following the convention outlined above, covfefetable  for example. Or 2) left-click the ID input box and similarly type a name following the convention discussed above. Once this last step is done the Material is set up and ready to be assigned. It will also be properly exported to IMVU. Once an initial Material is created, for situations where more than one needs to be used the process outlined above can be repeated with one or two minor changes. To generate a new material click the + button to the right of the Material List creating a blank Material slot in addition to the original (a sphere icon will appear absent a name). With the new slot available either; 1) with the new slot selected click the + New button below and repeat the above steps to populate. Or 2) select the original Material, click the + button in the Material ID block to duplicate, (re)select the new Material then click the Browse Material to be linked button (sphere icon to the left of the ID field) to select and assign the duplicated data to the new slot. IIhe new materials name will need to be updated following the naming convention discussed above which removes the auto-appended number Blender includes. Once the materials are created and assigned, managing multiple instances associated with different sections of the same mesh means making sure the numerical appends given to identify each are in-turn sequential – the materials themselves do not then need to be shown in the Material List in numerical order, i.e. 0, 1, 2, 3, 4, they can be listed as 4, 1, 3, 0, 2, just so long as the are all present. As with using multiple materials generally, the order they are assigned or appear to be listed does not matter, so long as the numbering is complete they will import correctly into IMVU. When using this approach to make content for IMVU use the Outliner Editor top-right to check material assignments – select an item in the 3D View to expose the information associate with it in the Outliner. For products made from several (separate) objects attention needs to be paid to ensuring the [n] value is sequential across multiple objects rather than surfaces. This can be checked in the Outliner Editor (top-right).